The time has come to wipe away waste and clean up your company’s act with some first-rate window cleaning software. If you’re looking to wash away double data entry and make the path forward crystal clear, you’re looking for a product like Smart Service. This robust window cleaning service software integrates seamlessly with QuickBooks to make scheduling quick and easy. How exactly does Smart Service integrate with QuickBooks? Glad you asked! 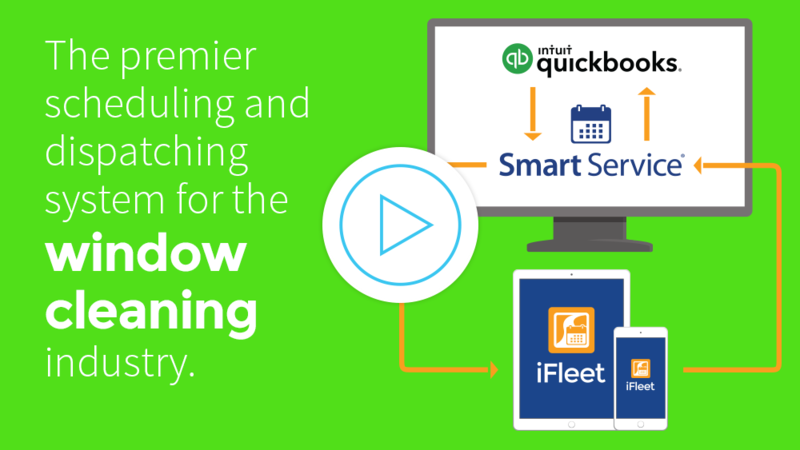 Smart Service is actually a full-fledged QuickBooks expansion, adding service scheduling, job dispatching, workforce tracking, and much more to the accounting application. To put things simply, the Smart Service software does everything today’s window cleaning companies need and more! Learn more. By combining with QuickBooks, Smart Service eliminates waste at every point of the job process. As soon as you set a job, that job is registered in both programs. Once completed, Smart Service automatically generates an invoice (or batch invoice) in QuickBooks. Stop entering the same information across multiple forms and systems. Simplify and streamline your business today with Smart Service! Learn more. Don’t let your workers get away with slacking off and monkeying around on the job. With Smart Service’s mobile app iFleet, you’ll be able to keep precise tabs on their progress, and even check in on their physical location. As a Window Cleaning business owner, you need to know that your crews are getting their work done effectively and efficiently. iFleet gives you that much-needed peace of mind. Learn more. Few people have ever taken a software search as seriously as Ken Bullinger, owner of New York’s Ken’s Window Cleaning. Ken scoured the land, traveling from state to state to observe other companies using the systems they chose. The result of Ken’s research? Ken’s Window Cleaning is now a proud Smart Service customer! Clean up your business with window cleaning software. Smart Service handles it all, working with QuickBooks on scheduling and dispatch. Mobile window cleaning software will improve your business more than you can imagine. Make the window cleaning business your playground.